Welcome to Fuerteventura, Canary Islands’ Paradise! Blue Sea Jandía Luz 2* invites you to an unforgettable stay in our hotels in Fuerteventura and will discover you such charming islands, declared Biosphere Reserve by UNESCO in 2009, thanks to its cultural value, landscapes and natural assets. The island of Fuerteventura is located in the Canary islands in the Atlantic Ocean, 100km away from the northern African coast, and very close to Lanzarote island. Its beaches have been named as as the best of the Canaries , and among the Europe thanks to its emerald color water and a beach friendly climate throughout the whole year. Fuerteventura becomes the perfect destination if you add the possibility to enjoy activities such as surf, windsurf or kitesurf thanks to the wonderful waves the Atlantic ocean provides. Fuerteventura more than 150km of beautiful unspoiled beaches both in the north and south of the island. Golden sand, cristal clear water and exotic landscapes… do you need anything else? 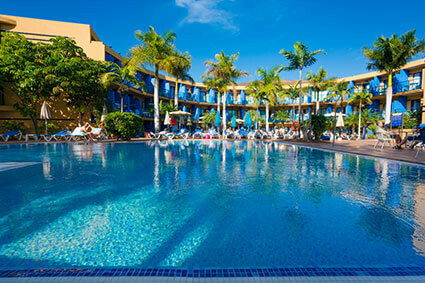 Enjoy your holidays in Fuerteventura in our Jandía Luz 2* hotel. We are waiting for you! Fuerteventura is of great interest if you are searching for a relaxed vibe, surrounded by nature and Paradise-worth beaches. We help you plan your holidays to Fuerteventura. In this guide to your Fuerteventura trip you will find information about what to do and see in Fuerteventura during your holidays in Blue Sea Jandía Luz. It’s not only about beaches, but wonderful hidden spots and emblematic places that will make you fall in love with the island. One of the most famous spots is Corralejo, , known for its incredible beach, small harbor and calm waters, perfect for families, it even has a natural park that stretches 11km with everchanging, white sand dunes. A spectacular sight yo usure don’t want to miss. If this isn’t enough, Corralejo also has a varied offer in terms of restaurants and leisure. From Corralejo you will see the wonderful Isla de los Lobos, a small and charming unhabited island. Its is easy to get there, and it only takes a few hours to walk from end to end. During the walk you will see not only beaches but a volcano and a wonderful old lighthouse. Those in love with adventure will find joy visiting the volcano in the Tindaya mountain, with wonderful views to the islands closer to Fuerteventura. Dare to hike to one of the most incredible sightseeing points of the island! Of course, Fuerteventura has a vast range of bars and restaurants for you to enjoy your holidays in a more relaxing way. Its typical dishes such as sancocho, papas, batatas or gofio will make you love, even more, such wonderful island. No matter if you are travelling solo, with family or with your partner, definitely Blue Sea Jandía Luz, will give you everything you are searching for in your holidays to Fuerteventura. Located in the north of the island, Corralejo brings a whole lot of Paradise beaches. The area holds a good number of golden sand beaches, that will make the wonders of all kinds of visitors. It is easy to reach by boat from Corralejo’s harbor. There are a lot of beaches to enjoy, but La Concha is definitely the place to go if you visit the island. This beach is protected from the waves, making its waters calm and safe for children. Gran Tarajal is a urban beach in the heart of Tuineje and brings many services along. In Gran Tarajal you will notice the sand is darker than usual in other beaches of the island, making it look like the black sand beaches in Tenerife. As in every Canary island, Carnival is the big event around. In Fuerteventura there is a different central theme every year, and many events take place around the Carnival festivity. It is a wonderfui, full of light and color event yo usure don’t want to miss. Romerías Romerias are the second biggest thing in Fuerteventura after Carnival. The romería del Tanquito or the romería de la Virgen de la Peña, are the important ones, taking part during september. It is a religious festivity in which the locals walk through with their animals, such as donkeys or camels, honoring the Virgen del Rosario. Apart from this main event, there are many dances and competitioons, folk songs singing and more, a great oportunity to get to know the roots of the Canary community. The battle of Tamasite ttakes place every year, during the festivities of Tuineje, declared of Cultural interest. This representation commemorates the citories of the 13th and 24th of november of 1740, during the defense against the assault of pirates. Visiting the island of Lobos is a highly recommended plan if you are travelling to Fuerteventura. Its is a small island, packed with wild nature, unspoiled beaches and even a volcano. A protected osasis. It owns its name to the old sea lions that used to wonder around the island. The island’s volcano is cald La Caldera, it’s the highest point of the island at 127m. It is possible to climb it and offers wonderful views to Lanzarote and the Corralejo dunes. We recommend visiting with sport shoes and sun block protection. The Corralejo’s Narual Park offers a unique landscape featuring the dunes. These dunes come from the natural, organic erosion of shells from the sea creatures. Under the dunes, there is a vast number of volcanic stones, buried under the thin, white sand. The Tindaya mountain is known as the sacred mountain. It is located in the north west side of Fuerteventura, and it has great archeological value. It is more than 400m high, and more than 300 engravings have been found already. If you want to visit it, you will need to ask for a permission with an authorised guide. This place is surrounded by serenity, peace, and mistery. In the south of the island you will find a small village with some shops and restaurants to enjoy.